Samuel Whitbread was born Cardington, near Bedford in 1720. When he was 14 he was sent to London as an apprentice at John Whitman's brewery. In 1742 Whitbread went into partnership with Thomas Sherwell and invested in two small factories. 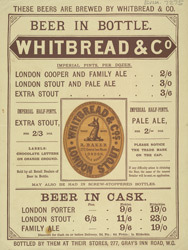 The first was in Brick Lane, East London, and produced amber beers. The other was known as 'The Goat Brewhouse', and produced a very popular strong black beer. In 1750, Whitbread moved his operations to Chiswell Street in London. This was the first purpose-built brewery in Britain, and in 1796 the Whitbread company became the first to exceed annual production of 200,000 barrels of beer.